One aspect of the monastic practices that is sometimes forgotten by the world is the monasteries commitment to hospitality. The Rule of St. Benedict makes the role of hospitality clear. The start to chapter 53 of the Rule sets the tone for the whole practice, “Let all guests who arrive be received like Christ.” The rest of the chapter is expanding on this principle and some housekeeping details of how the monastery should run with a guest, staying at the monastery. So hospitality is an important principle to monastics, other monastic orders have similar principles regarding the reception of guests. Since I think the lives of saints and stories about people often best demonstrate the principles we are to have as Christians, I have a story about a Benedictine monk who carried out hospitality to the end of his life. 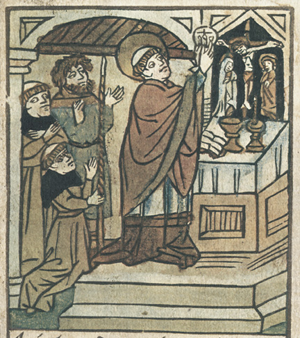 St. Meinrad was a Benedictine monk in the 9th century who lived in Switzerland. He lived as a hermit, in a small chapel. One day he was in the chapel praying and there was a ruckus caused by the chickens, which the hermit kept. While still in prayer it was revealed to the man of God what would happen. Soon two men arrived at the chapel. The monk greeted the two men, kindly and offered them the chapel to pray to the Lord on their behalf and told them after they were done praying to come see him and he would share the love of God with them and give them whatever blessing he could. The men entered the oratory, but did not do as Meinard had urged, but rather came back quickly out of the chapel. Meinard then gave them, his tunic and cuculla, then he gave them bread and drink. While in prayer it had been revealed to the man of God that these two men would kill him this day. However, for the love of Christ and the Rule, he greeted the men with an open heart and open arms, asking only one thing of them, to light candles at his head and feet after they had killed him, but telling them to be quick so that they might not be caught by people who come to check on him. So the men seized him and killed him. The murders did not get away with it; two ravens which often visited the man of God followed the men through the woods and alerted people to their presence and crime. So St. Meinard practiced hospitality to the point of death. He easily could have kept the doors to the chapel closed or tried to fight off the men. But instead he humbly submitted to God’s plan and even offered them to go and pray, so that maybe they would see the fault in their plan and repent. He also gave them food and drink for after their plot was carried out so they could stay refreshed when they fled. I am not saying that we should all give hospitality to those who mean to do us harm. But we should be willing to give friends and family hospitality. As a church we also have to be hospitable to guests. More than just handing them a bulletin when they walk through the door or shaking their hand as they come into the church. Especially in liturgical churches we need to have someone willing to sit with guests and guide them through the liturgy. Deacons are probably the best suited for this task when they are not required for liturgical jobs. But anyone in the church can help new people feel welcomed and offer them hospitality. This entry was posted in Monastic Monday and tagged church, God, hospitality, Jesus, Meinrad, monasticism, Monks, religion, St Benedict. Bookmark the permalink.